Sitting on the shelf at a Navy Exchange is a piece of commemorative naval aviation memorabilia that’s as authentic as a $20 Rolex. As blogger CDR Salamander posted, the garment depicted below is for sale at an unnamed exchange. 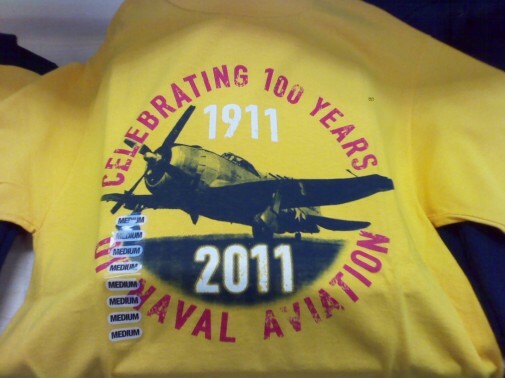 The issue: The aircraft depicted on the shirt has zilch to do with the Navy — it’s from some other part of the military. The Scoop Deck couldn’t verify what type of plane is on the shirt, and we didn’t want to make an educated guess because of a debilitating fear that we’d make a blunder as huge as, say, commemorating the centennial of naval aviation with a non-naval plane. Looks like a spitfire (from the half-moon covers on the landing gear). I think it’s a P-47 Thunderbolt. It is a Republic P-47….aka “tank-killer”. Top WWII ace was Francis “Gabby” Gabreski with “Unadilla Killa”. Sorry for the long URL. I hope it works. I agree. Looks like a P-47. USAAF P-47 delta model. Come on Scoop Deck – you should have known that. It’s a P-47 Thunderbolt … one of the earlier models with the razorback canopy.